There are many reason we love June Lake…Yosemite National Park a mere 30 minutes up the road, backcountry skiing literally right out our front door and some of California's best rock and ice climbing just minutes away. The June Lake loop is best known as a fisherman’s hub in the summer and a quiet ski resort in the winter. But scratch the surface and you’ll find much more if you're looking for human-powered mountain adventures. Following is just a sample of the best climbing, hiking and backcountry skiing options we have in and around June Lake. Drive thirty minutes from June Lake up Tioga Pass road and you will arrive at the Eastern entrance to Yosemite National Park. Tuolumne Meadows is the main area here and offers rock climbers some of the best rock climbing in a state that has the best rock climbing in the world. Climbing is on the famous granite domes in the Yosemite high country with everything from easy crack climbs to thought provoking run-out slab routes. The hiking around June Lake is almost endless. In the June Lake Loop there’s a few great options such as the Fern Lake trail which switchbacks up an old glacial moraine to pleasantly quiet Fern Lake. Another favorite is the Parker Lake trail, which goes for about 3 miles to spectacular Parker Lake. Although it’s a great late spring and summer hike the fall colors are a special treat for those hiking up to Parker Lake. The Gem and Agnew Lake trail that begins at Silver Lake will take one as far into the backcountry as you would like to go, even all the way to Mount Whitney or the Canadian border as the trail joins up with the John Muir Trail and the Pacific Crest Trail. Go just outside the June Lake Loop and once again you’ll find some of the world’s best hiking in the high country of Yosemite National Park. There are so many great day hikes here it’s hard to nail them down, but favorites would be the mellow hike up Lyell Canyon out from Tuolumne Meadows along the John Muir Trail. There’s also the hike within the Inyo National Forest from Saddlebag Lake to the 20 Lakes basin passing by, you guessed it, twenty small lakes. There’s also backpacking galore. California’s high sierra is known as one of the world’s top wilderness backpacking destinations. June Lake is a great base for a backpacking trip into Yosemite and the High Sierra. In June Lake we are lucky to have June Mountain Ski Area, a quieter alternative to nearby Mammoth Mountain. While June Mountain may be considered a smaller ski resort with mostly intermediate terrain, it has the best access to backcountry skiing in all of California. June Mountain has an open boundary policy, which means you are free to use the lifts and then ski out of bounds and into the backcountry. Of course, this is something only experienced and trained backcountry skiers should consider doing without a guide. Many hazards exist, not the least being avalanches. The main backcountry skiing attraction here is what is known as "the Negatives". They are a series of Northeastern-facing bowls and chutes that come off of San Joaquin Mountain. The base of these chutes are easily accessed from the top lift at June Mountain. There’s also Carson Peak, which dominates the landscape in the June Lake Loop. The North facing Carson Bowl is a favorite which culminates with a ski down the “Devil’s Slide” that spits you out right at the hot tubs of the Double Eagle Spa. For experienced skiers and boarders who are looking to get beyond the groomers and explore the endless backcountry there are local backcountry ski guides available to safely show you the goods and teach you the basics. 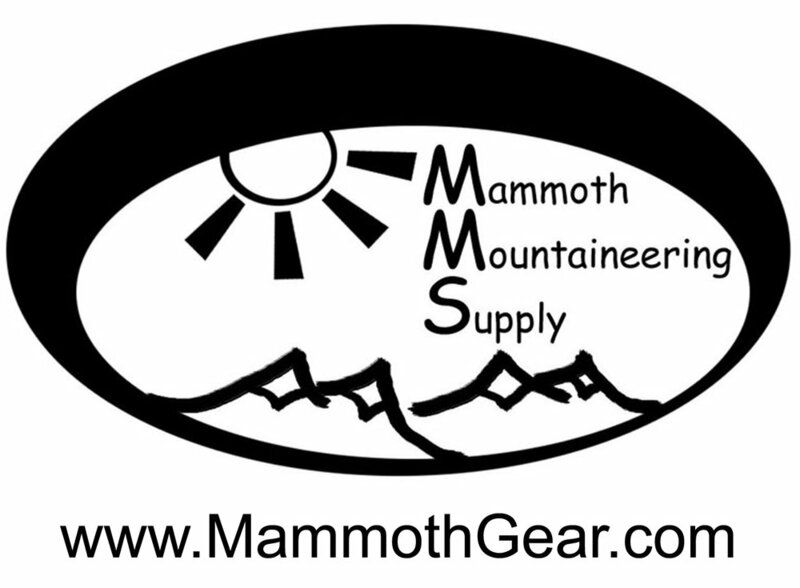 Stores in nearby Mammoth Lakes rent backcountry ski equipment and split boards. Ice climbing in California? You bet. The June Lake Loop and nearby Lee Vining canyon boast the best waterfall ice climbing on the West Coast. Ice climbing may seem very audacious, and it is. Donning crampons on their heavy boots and ice axes in their gloved hands, ice climbers have made a sport out of climbing frozen water. June Lake has the best beginner ice climbing routes in the state on Horsetail Falls at the far end of town and at Roadside ice just past the winter closure of Highway 158. If you are looking for something a bit steeper you'll want to drive 30 minutes down the road to Lee Vining Canyon where you will find much longer and steeper ice climbing routes. Some of California’s hardest ice climbs will be found here. Hiring an ice climbing guide is a great idea if you want to give ice climbing a try. Ice climbing classes are available most weekends from late December till early March. So there you have it, June Lake in California’s Eastern Sierra is not all just about trout fishing and skiing easy groomed runs. There is much more than meets the eye for the outdoor adventurer looking to get their adrenaline fix in the mountains. Just don’t tell anyone! Lead Guide April Mayhew and California Alpine Guides were featured this week in VisitMammoth.com! Can you tell which classic Sierra summit the author, Monica Prelle, and April Mayhew are celebrating? When creating new partnerships, communicate clearly and honestly about your climbing experience. A positive and enthused demeanor and honesty up front will get you far in this sport, and Novice and Advanced Climbers will embrace newer climbers if they’re specific about their current experience. Misrepresenting one’s experience is never appropriate and is often transparent to everyone save the offender. This goes for both ways, as more experienced climbers sometimes misrepresent their climbing experience as well. Feel free to ask around to pre-qualify potential new partners. Show up On Time and Prepared. Pack the night before. Leave your house early so you’ve enough time to finish your time-sensitive errands. Do your homework and arrive prepared. You may learn something. You may meet new people. You may realize you’re in a slump in the former climbing partnership. You may need a break from your adventure partner or life partner. The possibilities are endless, and collaboration helps us evolve as Climbers and People. Cues are sometimes hard to notice, but here’s an example: if someone can’t remember what their hardest rock climb was, whether they top roped it or lead it, where or when it was, they are likely misrepresenting their climbing experience. Be Repetitively Late or Ill-prepared. Free time is expensive and shouldn’t be wasted. Don’t make your partner wait at the trailhead while you’re waiting in line for a cappuccino or sorting through your disheveled life scattered about the back of your truck. You're already running late. Don't misrepresent your second estimated time of arrival and be late again i.e. don’t fib on the new texted ETA and show up 25 minutes late instead of 10. Your honesty could give your partner extra time, perhaps best used to wait in line for a second cappuccino instead of empty-handed at the trailhead. Use a Climbing Appointment as ploy to hook up, unless otherwise stated. Although some climbing partnerships become life partnerships, don’t only climb or attempt to climb with persons who you want to date. Desperation is transparent and unattractive. Perfect climbing partners are extraordinarily invaluable and can produce a wealth of climbing adventures. All had to start somewhere. Enjoy the process! Whether you’re introducing climbing into your repertoire of adventurous hobbies or you’re already a veteran of this glamorous sport - if you’re hooked like the rest of us, you’re likely striving to achieve your personal best. How we evolve into the Best Climber we can be is dependent on many, seemingly ungovernable factors such as strength, athletic ability and technique. Conversely, how we evolve as Belayers is totally within our control. While our climbing performance can fluctuate wildly from one day to the next, every time we belay we should be performing consistently and at our best. Consider the alternative: the consequence of performing subpar as a belayer can cause safety hazards, undue stress, loss of friends or friendships, loss of climbing days. Essentially, no one wants to be belayed by a bad belayer. Thus, half of striving to achieve our personal best within the sport of Climbing should also be evolving into the Best Belayer we can be. For the past weeks, I’ve climbed with strangers and friends alike, and used their experience as resource for this blog post. When interviewed, an overwhelming amount of seasoned climbers described their Perfect Belayer as Present, Attentive, and Communicative – all key points we’re discussing today. To build the best belayer, we must first lay the foundation of Technique and Knowledge. During a climbing trip to Rifle, while belaying I noticed I would (annoyingly) occasionally short the climber rope. Once, it happened to a friend who scolded me and asked to be lowered off his project. I apologized and said it was happening more often with the new GriGri 2. He asked if I had watched the instructional video on how to belay with the new design. I drove into town that afternoon, found internet and streamed the video. With new insight, I returned to the crag and convinced my buddy that I had overnight become the best belayer I could be. Everyone lived happily ever after. The End. As much as possible, both our climbing ability and our belaying ability should evolve simultaneously and with an equal amount of Importance and Intention. Setting up your stance appropriately. Of course, one’s ability to learn anything is completely dependent on how much they apply themselves to the learning process. Today, the average consumer researches 89% of their purchases, myself included. Most of the items I am researching are not equally researched by their manufacturing entities, proven by the large percentage of returns Amazon.com may receive from my house each month. Uniquely, the climbing equipment manufacturing industry researches 100% of their manufactured climbing hardware, including belay devices. Further, said test results are published online, for free, usually alongside similarly useful manuals and instructional videos. While not overwhelmingly dramatic and exciting for some (myself excluded), said resources are incredibly helpful in strengthening one’s belay technique. Free knowledge! How did Wayne Gretzky achieve multiple career records of most regular season goals (894), assists (1,963), points (2,857), and hat tricks (50)? How would Mario Andretti have taken home 12 Formula One championship trophies without a stellar support crew? How do Chris Sharma, Joey Kinder or Lonnie Kauk repeatedly establish and send hard routes? The commonality between Gretzky, Andretti, Sharma, Kinder and Kauk is behind all their exceptional successes, these athletes have solid Support Teams made up of people striving to use all their resources and capabilities to execute their supportive role flawlessly, expertly. Consider Belaying as similar to being a Support Team to a climbing partner. As a Support Team, the belayer must be alert, physically available, and have intention for the moment. When not any or all of these things, the Climber is the one that pays the price. Similar to any athlete, no Climber performs better when their focus is compromised. A short catch, a shorted clips, blatant daydreaming or inappropriate crag chat all can translate up the rope to the climber that the belayer has clocked out. Last night I projected a route at a local crag with a new climbing partner. While I was working the crux, he asked me what else I wanted to climb next, you know, after I was finished with the climb he just projected. He went onto suggest a few routes, not noticing that I wasn’t interested in discussing a future beyond my current project. Consequently, his belay sucked, e.g. the rope was too tight, and a few times when I requested slack or tension and received neither, I looked down and saw him staring off into the distance, seemingly daydreaming. Later we chatted about where his head was at. He admitted to be totally checked out, bummed that he didn’t send, and was about 5% concentrating on belaying. We laughed it off over a beer. Some climbers want to be koo’d, talked to, coaxed on, roasted, yelled at, coached. Some want silence. Some want beta and others do not. Some want the rope tight when projecting, and others want a slack system to give them room to maneuver. Some want both at different times. A good belayer recognizes all of this and does their best to accommodate the preferences of the climber, not themselves. One of our local crags is the Owens River Gorge, a climbing area known for single pitch sport routes. Most of the climbs have been established or retrofitted with a mussy hook anchor system, which avoids the need for a climber to rethread or rappel off the anchor. Rarely do you hear “Off belay” spoken at the ORG, so it surprised me when a death at the crag occurred when a climber/belayer duo misunderstood each other. The climber told the belayer “off belay” which was heard by neighboring parties, and the belayer followed instruction, however the climber leaned back as if to lower. Unfortunately, the climber didn’t survive the fall. All of above can happen relatively spontaneously and simultaneously. Accidents are more likely to happen when one or more of these factors exist AND there exists no clearly defined plan of action. Thus, regardless if I am the climber or if I am belaying, I much prefer to discuss with my climbing partner our plan of action when we’re face to face rather than a pitch away from each other. It takes a fraction of time to come up with a plan when both parties are face to face and is hugely more efficient than becoming the loud party stuck on a pitch trying to communicate “off belay” or “on belay” around a corner and 60 meters apart. In 2013, the AAC’s Accidents "Know Your Ropes: Lowering" article by Mike Poborsky speaks to proper communication techniques and suggests ways to eschew lowering accidents. I highly recommend picking up a copy of this enlightening publication. Consider it further Inspiration to be the Best Belayer You Can Be. Next up, find the perfect climbing partner! Picking up where we left off, this week we’re highlighting a technique that is similarly useful to know on the occasion you are adventuring off the ground on a multi-pitch alpine route, mountaineering across glaciated terrain or climbing in a single pitch environment. Scenario: Leader takes a fall. The rope has been fed out past the halfway point or lowering the Leader would put them father away from you, the Belayer, and the anchor. The Leader’s full weight is being held by your break hand and your belay device attached directly to your harness. The first objective is to free your hands; next, transfer the Leader’s load to first a friction hitch; then, transfer the load from the friction hitch to the anchor. Off of the back end of your brake hand i.e. hand that is holding/breaking the fall, pull a bite of rope through the belay device, and tie off the bite with a Munter onto the locking carabiner. Photo courtesy of Climbing.comAlternately, you can tie off the Munter hitch onto the load strand above the belay device (fig 15-17). This step frees your break hand for future tasks. Using your cordalette, place a friction hitch on the Main Load Strand (rope that is going from your belay device to Climber) at a location within arm's distance of yourself and the anchor. I like using the Klemheist as a friction hitch here, however the Prusik would work just as well. Your preference. Secure the back end of the cordalette to the anchor using a Munter/Mule combination on a locked carabiner, then tie an Overhand knot to make the Munter/Mule catastrophe-proof. On the back end of your belay device/Munter tie off (Step 1), secure the rope to the anchor using a Munter/Mule/Overhand combination onto a locked carabiner, making sure that the rope is underneath the friction hitch cordalette. This system backs up the friction hitch in case of catastrophe. Slowly lean towards anchor and friction hitch, unweighting your belay device, watching to ensure that the friction hitch is able to hold the entire load. 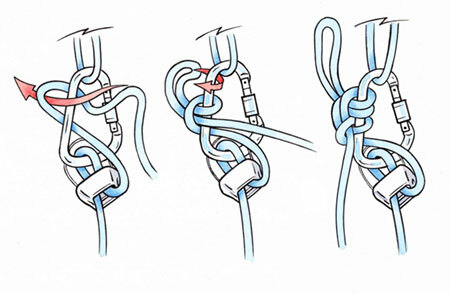 If the friction hitch is solid, you’re clear to untie the Munter and remove the rope from your belay device. Now, a large amount of slack will have built up between the friction hitch and the Main Strand Munter/Mule. On the main strand Munter/Mule, untie overhand and mule knots, pop the Munter, remove the slack, and retie the Mule/Overhand. Slowly maneuver the friction hitch closer to the anchor, which will transfer the load to your main strand Munter/Mule. This completes the load transfer onto the main strand Munter/Mule. From here, you're hands are free to execute whatever future steps required, such as rescuing the car keys from your clumsy partner, rappelling down, and grabbing a beer. Pfew, close call! Next up, Be the Best Belayer Ever! Traveling from long and far, our diverse team collided in Quito for a rejuvenating evening spent on the town. 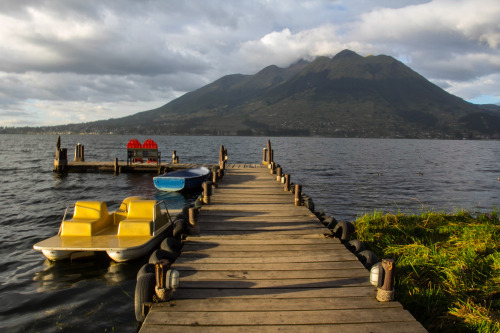 The following morning, we ventured northeast, past Cayambe, to arrive at Puerto Lago, a stunning lakeside resort nestled at the base of tall volcanoes. Here we spent the afternoon touring the countryside, playing billiards and catching up on World Cup futbol. We set off through the Otavalan countryside to Laguna Grande, one of three high altitude lakes positioned at the base of Fuya Fuya (13986’/4263m), a mountain formed by two inactive volcanos sharing the same saddle. Through tall grasses and groves of Andean pineapple, the team climbed to the East Summit and enjoyed lunch amidst views of the surrounding countryside. We returned to Puerto Lago in time for the Ecuador vs. Honduras game. Today we depart for the town of Cayambe, where we will hire a local four-wheel drive vehicle to shuttle us up the road to Cayambe’s refugio as far as the road will allow. From there, we will hike the remainder of the way, and set up camp near the closed refugio at (15092’/4600m). 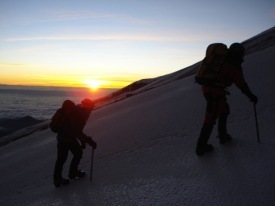 We plan to spend two days and nights acclimatizing on Cayambe prior to going for the summit on June 24. Si se puede! I Just finished up a very successful Mexico Volcanoes Trilogy of Pico de Orizaba (18,451), Ixtaccihuatl (17,000 ft) and La Malinche (14,600 ft). 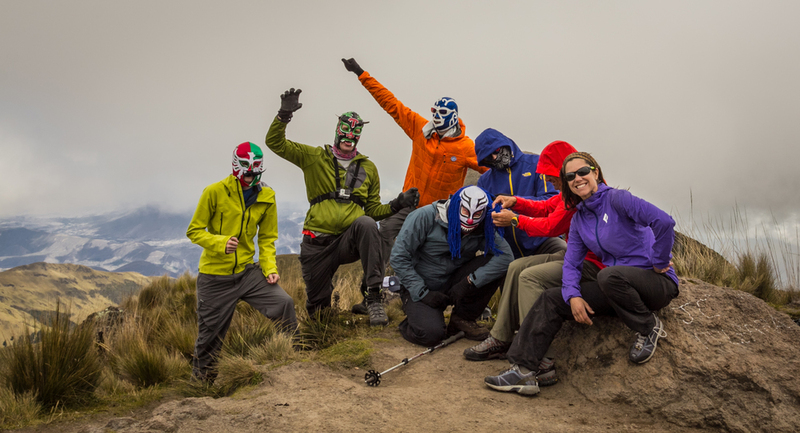 In addition, two of the guests added on Nevado de Toluca (15,200 ft) to the beginning of the trip. We summited all the peaks! The trip began with meeting John and Ken in Mexico City. The next day we met up with Guillermo "Huracan" Vidales, my good friend who with his brother owns our Mexico logistics company. We traveled East of the city through the city of Toluca and on to the slopes of Nevado de Toluca, where we did a short acclimating hike. After an evening in downtown Toluca (which has a very nice renovated downtown area), we drove back up to the trail head and summited Nevado de Toluca (15,200 ft) which is basically a walk up with no snow and just a little rock scrambling. During the climb we had amazing views of Nevados crater lake. Then it was back to Mexico City for the night where we met up with our third guest Eric who was joining us for the normal trilogy. CAG guide Zeb Blais also joined us for most of the trip. Zeb was down here on a mission to ski Orizaba. Ken, who was only here for the first part of the trip, left us here to head home. The next day we traveled to the slopes of La Malinche via the mysterious pyramids of Teotihaucan. We also ate a gourmet Mexican lunch in a 100-year old restaurant called "La Gruta" located down in a cave. After an evening in the cozy cabins at La Malinche we had a great hike up La Malinche and were rewarded with great views of our next two peaks...Ixtza and Orizaba as well as the very active volcano Popocatepetl. Then it was back in the van for an afternoon drive to our next acclimating spot in a resort and trout-rearing facility at 11,000 ft on the slopes of Ixta. After an excellent dinner of fresh trout and a quiet nights rest in comfy rooms with a roaring fire, we did another acclimating hike high up the slopes of Ixta. Then it was on to the Alztomoni climbers lodge located near a microwave tower at 13,000 ft near the trail head for Ixta. At 1am we woke up for our alpine start to find it raining...not a good sign. We waited at the lodge for an hour and a half to see if the rain would stop and at 330am decided to go for it anyway. Our route was the "knees route" finishing up on the Arista del Sol. As luck would have it, the rain did stop and we managed to summit Ixta at 17,000 ft in the fog. We were robbed of our views, but we gained the summit! After a quick descent back to Guillermo and the waiting van we had a bumpy ride down to our hotel in the ancient city of Cholula for a shower, good dinner and some well-deserved rest. The next day was for resting and exploring the Cholula's pyramid (The largest in the world), some markets and the neighboring cosmopolitian city of Puebla where we ate a fine dinner consisting of some of the best mole I've ever had. All rested up and our bodies recovered at a lower altitude, we traveled to our next objective and the main event...Pico de Orizaba. Once again the weather forecast didn't look great. On our 4wd trip up to base camp it was raining hard and we got stuck in the mud four times. Luckily Zeb and Holly were headed down from a successful ski summit of Orizaba and we were able to switch vehicles with them which got us through the mud on on to the hut at Piedra Grande basecamp. With the forecast calling for more rain and snow, we awoke very early at 1am on Mexico's Day of the Dead for our summit attempt. The skies were clear, but we really didn't think it was going to last so we wasted no time and set a quick pace up the lower scree slopes towards the route finding crux known as the "Labyrinth". Large lightning storms far off over Veracruz lit up the mountain, but were so far away they posed no risk..yet. Donning crampons and ice ax for the first time of the trip, we quickly made our way through the labyrinth and on to the Jamapa Glacier, a moderately pitched but exposed slope with no crevasses. As always, the crux of the day is the last heavy-breathing hour up 38 degree slopes to the crater rim at 18,200 ft. The weather was holding but the clouds in the near distance were gathering. No thunder yet, which would of course turned us around immediately. At 745am John, Eric and I stood on the summit of North America's 3rd highest peak at 18,491 ft! Then it was a quick descent and an afternoon of traveling back to a hotel in Puebla for a shower and rest. We celebrated Dia de Los Muertos or "Day of the dead" by having a celebratory steak dinner at an Argentinian steak house with some fine Mexican red wine produced by my families vineyards in Baja California. An awesome trip all round and thanks to Huracan for making everything happen so smoothly as usual and to Eric, John and Ken. And congrats to Zeb for his successful ski of Orizaba. 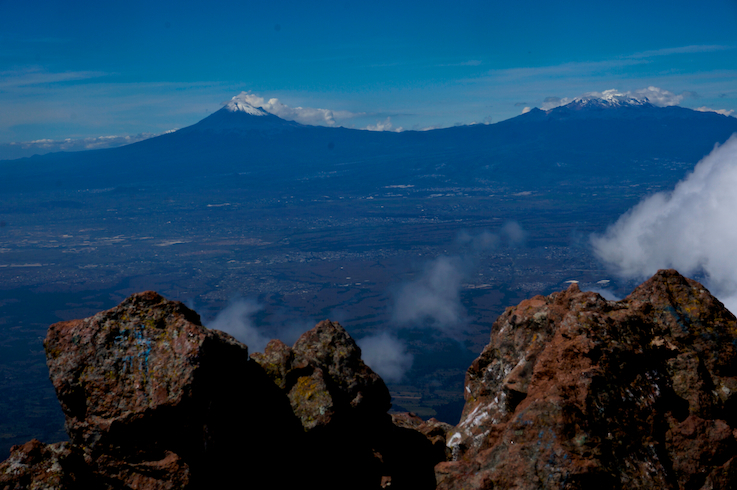 I'm already looking forward to more Mexico Volcanoes adventures this Jan and Feb! 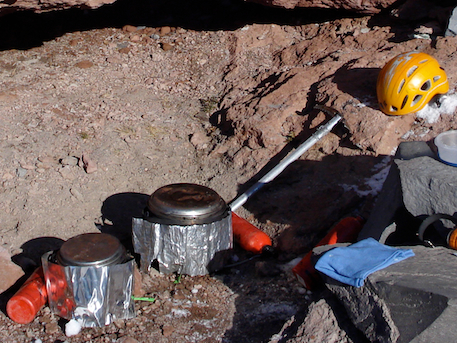 The age-old argument over which type of fuel is best for back packing stoves may never die. But here is a mostly impartial breakdown of the pros and cons of both types of fuels from our experience. What we are talking about here is the debate between using a liquid fuel stove such as white gas or using a cartridge with a butane mix. Both types of fuels have their place, but there are also situations where one over the other is the smart choice. A white gas stove is far more efficient and economical if you are cooking or melting snow for a large group or for extended periods. They are also more environmentally sound since there are no disposable canisters. In addition, white gas is the choice for cold temperatures below freezing. The disadvantages of a white gas stove is that they are trickier to operate, require priming and the stove unit is heavier. A canister stove is far lighter and far easier to operate and is a great choice or one or two people on a 2-4 day trip in above freezing temps. The disadvantages are that they just don't work well in colder temps as the fuel canister needs to stay warm in which to operate properly. Not a problem in the summer or if you are using it for a short period of time in the winter. Another issue is that the number of canisters required for a larger group or extended trip make them much more bulky than white gas. The same goes for the cost of fuel on bigger trips. Hope this helps. We have both types of stoves. You will find us using white gas on most of our guided group trips. But if we are going light and fast on our own, you may find us using a Jet Boil or similar canister system. As an international mountain guide I tend to find myself in some pretty spectacular places. The photo opportunities can be downright breathtaking at times. However, while in the mountains my first focus is on safely guiding my clients or efficiently completing a personal climb and not on photography. Lugging around heavy DSLR photography equipment on technical climbs is simply out of the question. For a long time a pocket-sized point and shoot was the only option. As good as point and shoot camera’s can be, many times I wished I had something that had a bit more control with better optics. Enter the new mirrorless interchangeable-lens category of cameras. Many of them have the same control features, lens optics performance as an entry-level to mid-range DSLR as well as a large sensor…but at a fraction of the size and weight. They come in just about right in between a point and shoot and a DSLR in heft. Thinking this could be my answer, a year ago I purchases a Sony NEX 5N mirrorless lens camera with a 18-55m zoom lens. I couldn’t have been happier with my decision. The first big test of my new Sony NEX was a guided climb of the Matterhorn in Switzerland. I left it in a Mountainsmith weather resistant, padded case around my shoulder for the entire day. Have to say I barely noticed it, and some sections of the Matterhorn require vertical climbing. When I needed it, there it was ready to go. It also fits nicely nicely in the top pocket of a 30-liter pack (it still wont fit in a pants pocket though!). It comes with me on most of my longer climbs now when a pack is involved and I’ve since purchased a small neoprene camera cover that protects well but is smaller than a regular case…a camera cozy! Unlike my point and shoot, I have the option of manually controlling my camera with the usual options of full manual, program, aperture or shutter modes as well as ISO and all the other modes you would find in an entry level DSLR. Even in full auto mode the photos came out superior to what my point and shoot could do. Honestly, while on a climb I’m mostly shooting in full auto or maybe aperture mode. But while back at camp or the hut it’s great to be able to switch over to one of the manual modes and have more control over my shots. Not to mention a much better lens. Next to a DSLR the big thing you lack in a mirrorless camera is, well, the mirror. The lack of a mirror is the biggest reason the camera is made so small. This means you can’t have an optical viewfinder and must use either the LCD screen or an electronic viewfinder, depending on the model. Even though Sony’s EVF is one of the best in class it’s still a bit like looking through a TV screen. I found myself getting used to it though. One other drawback compared to a DSLR is less lens choices since the lens mounts are proprietary, but that is changing (Zeiss lenses are becoming more common for NEX systems now). Let me state that I am not professional photographer and would be more defined as an enthusiast. However, I am always striving to get more serious about my photography and it’s hard to do that with a point and shoot. I also run two websites that display a lot of photos. The Sony NEX system has been reviewed very favorably by the pros. Here’s a great review of the new Sony NEX 6 by Digital Photography Review. Sony makes four models of NEX cameras: the NEX 3 entry-level model, the NEX 5 packed with more features, the NEX 6 that offers full DSLR control and the NEX 7 professional model with a larger sensor. The Nex 3 through 6 models come with a 16.1MP APS-C Size sensor and the NEX 7 a 24MP sensor. The NEX 3 and 5 have touchscreen controls and the NEX 6 and 7 have DSLR style controls. I just upgraded to the NEX 6 for full DSLR dial controls and a few more shooting features than the 5. Having to access a touch screen menu while at a belay station was just too tedious. I didn’t see much difference between the 6 and 7 except for the extra megapixels, which I didn’t think I needed (or had the space for on my hard drive!). Check out more technical info at Sony.com. So far I’m very happy about my choice and feel that I have a compact camera that will grow with me as I get more serious about my photography. Most importantly, I have a high quality camera that will actually come with me on the climb! Mont Blanc, at 15,780 ft, is the highest peak in Western Europe and the EU. Until the 1980’s it was mostly considered to be the highest peak in all of Europe until geographers decided that Mount Elbrus in Russia was actually within Europe (and 3000 feet higher). Plus, before the Soviet Union fell apart Mont Blanc was much easier to access! Mont Blanc, also known as Monte Bianco in Italian, means “white mountain” in english and straddles both France and Italy. The French side is predominately glaciers while the wild Italian side takes on a different character with massive rock ridges comprising some the most difficult and classic alpine routes on the continent such as the “Inomminata Ridge”, the “Peuterey Integral” and the “Central Pillar of Freney” among others. The French side boasts the two most popular and easier routes on the mountain, the standard “Gouter Route” and the longer “Three Monts Route”. The French side is also a popular ski mountaineering objective in the spring via the Grand Mulet route. The mountain is steeped in alpine mountaineering history. It is the site of the birth of mountain climbing as a sport when in the late 1700’s a wealthy Frenchman put up a large sum of money to anyone who would dare be the first to climb it. In 1786 two Frenchmen, Jaques Balmat and Michel Passard set out from Chamonix clad in the costume of the day. They summited on Aug 8th and heralded the beginning of modern mountaineering. In the very late 1800’s a plan was hatched to build a train route all the way to the summit via tunnels under the glaciers. Fortunately, the project ran out of money and the train currently stops low down at about 8000 feet and now provides access to the Normal climbing route. In other interesting Mont Blanc history, in 1966 an Air India flight carrying 117 people misjudged their approach to Geneva and smashed into the Bossons Glacier killing everyone on board including the designer of India’s first nuclear weapons. Just last year, some tourists found an Indian diplomatic pouch melting out of the glacier from that same crash and it was returned to India. Mont Blanc also has the dubious distinction of being one of the deadliest peaks in Europe. More mountaineering accidents happen here than anywhere else in the Alps due to it’s high altitude and the presence of objective hazards on the two most popular routes. But, with up to 20,000 people attempting the peak each year the per capita accident rate is really not that bad. Regardless of the hazards of the mountain, Mont Blanc is a great objective for climbers who are experienced in Alps climbing or for those going with a qualified guide who can mitigate the hazards. While not technically difficult, climbing the EU’s highest peak is very physically challenging. However, the views of the entire Western Alps and the chance to walk in the footsteps of mountaineering history are well worth the effort! Most mountaineers are goal-oriented individuals. They are in search of a physical and mental challenge that will push their limits, including everything from sleep-deprived alpine starts, carrying heavy loads, loss of appetite, rock and ice climbing in thick boots, extreme weather temperatures, and the ability to stay flexible and positive. As a guide, I have seen many folks show up to the trailhead without training at all for the planned trip. The only element of mountaineering that can be controlled is training and preparation. Hard work and dedication to training will add depth to your mountaineering success. This article outlines the approach to completing a training program for a standard 3-day mountaineering climb, with approximately 7000 feet of elevation gain, carrying a 40 lb pack (comparable to climbing Mount Rainier or Mount Shasta). The training program will consist of strength training, cardiovascular endurance training, and the requisite mental training it takes to complete the program. This type of 3-day climb requires an average of 10 hours of training per week for approximately 16 weeks. The time is divided for 2-3 strength workouts, cardiovascular training, and long hikes on the weekends with a pack. If you have a restricted schedule due to work commitments, it will require extra logistics planning to ensure that you can complete workouts, taking into account considering drive time to and from your workplace. Ascending a mountain uses different muscle groups than descending. Your strength training should incorporate a balance of upper body, lower body, core and balance. My training programs for the inexperienced mountaineer typically target all the major muscle groups first and then proceed to focus on any muscular imbalances that may arise. A certified personal trainer who can advise you in-person can be a powerful tool in helping an aspiring mountaineer define these specific areas and focus their training to strengthen them. In addition to boosting overall fitness, strength training will prepare you for crossing streams, walking on snowy slopes, tackling low angle glacier terrain, and hiking on talus. The strength training should focus on glute strength (including such exercises as lunges, squats, single leg deadlifts, bosu training, and step downs). Upper body exercises, such as standing rows, lat pull downs, shoulder internal & external rotations, and rear delt raises, will also strengthen the back and prepare it for carrying weight. Further, strength training can incorporate a lot of balance, by practicing cable rows while standing on an unstable surface, doing pushups on half foam roller, and bicep curls while standing on one leg. Cardiovascular training will be necessary throughout the training program. The majority of my training programs incorporate only the activities and equipment that are accessible to the client, for this reason I often prioritize cardiovascular training that can be completed outside. In my own life, I find that cycling, swimming, trail running, and hiking with a pack on are all accessible cardiovascular activities that I can squeeze into my schedule without a ton of preparation or emphasis on equipment. On days when the weather is terrible or you experience unexpectedly difficult time management; you can be creative with what you can do in the gym. The Versaclimber (a standing climbing simulator that many gyms will have on their cardio floor), spin classes, group exercise and full body conditioning, and running on the treadmill are all great options for improved. So you want to climb the Matterhorn. Not many peaks in the world are as iconic and recognizable as the famous peak straddling Switzerland and Italy know by the Swiss as The Matterhorn. So it stands to reason that climbing the Matterhorn is a major goal of many climbers. But what does it take to scale this famous peak? We will take a look at what it takes to climb the Hornli Ridge from Zermatt, Switzerland, by far the peak’s most popular route. A climb of this nature is not easy to describe to climbers who have not been to the Alps. A common question is “What is it rated”? The answer to that question is probably 5.4 in the US rock rating system. However, that doesn’t even begin to tell the whole story. The Matterhorn is a classic alpine rock climb with some snow and ice near the top. This means you must climb it in lightweight alpine climbing boots and sometimes with crampons on. This of course adds to the difficulty and can take some getting used to. The day starts usually around 4am at the Hornli Hut at an elevation of 10,600 ft and the summit is at 14,692 ft. That means there is approx. 4000 ft of steep climbing to be done in less than 10 hours. Most of the Hornli Ridge is probably 3rd & 4th class scrambling with occasional sections of easy 5th class. There are even some vertical fixed ropes which must be climbed hand over hand. The climbing is relatively easy for those with rock climbing experience, but very exposed. When with a guide, you are moving roped together without an anchor for much of the route. As with many peaks, you want to be done and back at the hut by mid afternoon at the latest, so you can see that speed is of the utmost importance. There are no real breaks on the climb. The way down is the same way you go up and it’s not really any easier. It’s go, go, go for 8-10 hours. The need for speed, the sustained nature of the climbing and scrambling, as well as the altitude all combine to make the Matterhorn a very athletic endeavor. Being in excellent cardio shape is key to success. Having rock climbing scrambling skills are also key, you must be sure on your feet! Also, the exposure is massive. We are talking 4000 foot sheer drops down to the glacier. You must be comfortable with exposure. And of course, you must be acclimated before attempting such a climb above 14,000 ft. In the years that I have been guiding the Swiss Matterhorn, I’ve seen 5.10 rock climbers with no previous Alps experience struggle. I’ve also seen veteran peak baggers in great shape and with good scrambling skills, but with no real technical rock experience, do great. All said the Matterhorn is not an exceptionally difficult alpine climb if attempting with a guide (route finding can be tricky if attempting on your own). It just requires excellent physical shape and a skill set that allows you to move fast and efficiently on exposed rock. 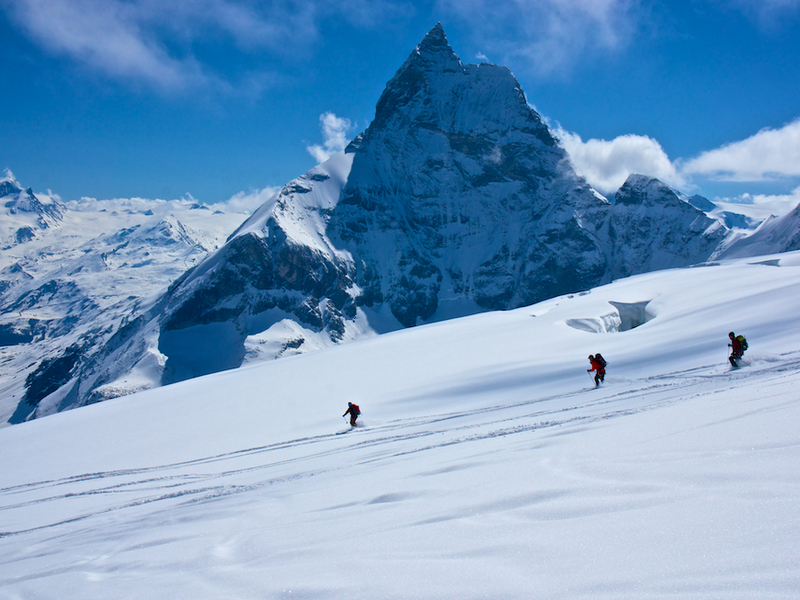 Conditions are always a concern when planning a Matterhorn climb. Since the Matterhorn is primarily a rock climb a summer snowstorm (not uncommon in the Alps) can put the route out of shape for climbing. Snow covered rock makes the route just too dangerous and slow going to attempt reasonably. Some snow may be ok but too much and you might as well set your sights on one of the other fantastic alpine climbs in the Zermatt area. The picture shown above is the Matterhorn in summer, but clearly out of shape for climbing. All in all, the Matterhorn can be one of the more memorable days of your climbing career! I like equipment that serves more than one purpose. I’ve found that in the Klean Kanteen insulated bottle. It’s my extra water bottle, my camp mug and my thermos all in one. It’s a double walled bottle, not a thermos. The big difference here is that it holds more liquid for it’s size. No, it’s not quite as insulated as a thermos but I still seem to have hot tea 4 hours into a cold high altitude climb. The 16oz size also makes a perfect camp mug. They even sell a mug top for it separately, but I don’t see the need for it personally. Sometimes I only really want to carry 1 ½ liters of water on a climb so the 16oz insulated bottle is perfect along with one of the non-insulated one-liter bottles. The short answer is, well, not really. The problem is that the mountaineering boot you want to climb, say, the Swiss Matterhorn is an entirely different style of boot than you want to climb Denali in Alaska. The Matterhorn is climbed quickly in moderate temperatures and involves a lot of steep rock climbing in addition to some snow and crampon work and for that you need a lightweight mountaineering boot that has some sensitivity for the rock sections but can still take crampons for the upper snow and ice sections. Denali is a cold and high Alaskan peak where the only climbing movement is walking upright on snow and ice. This requires a very warm, highly insulated boot where sensitivity is not a concern. If your goal is to be an all round mountaineer and alpine climber you will need a quiver of mountain boots. Two boots will suffice for most situations, but three boots would cover just about all your bases. A mountain boot would be loosely defined as a climbing boot that has a stiff lug sole for climbing snow and ice and is suitable for use with crampons. Following is a description of three basic mountain boot designs and their uses. This is the nimble boot you use for fast and light summer climbs in the Sierra Nevada of California, The North Cascades of Washington State, The Alps of Europe and any other place where the temps during the day are above freezing but where you may encounter snow and ice in addition to rock sections. These are stiff leather boots with lug soles and little to no insulation. Most are waterproof with waterproof/breathable linings and they will take a strap-on or semi-automatic crampon without a toe bail. They breath well and are much lighter than other alpine boots which make them great for those long trail approaches and more technical rock sections. However, they just don’t have the insulation you need when the temps get well below freezing. Examples are the La Sportiva Trango GTX, The Scarpa Charmoz GTX and the Garmont Tower GTX, among others. This is the big daddy of the mountaineering boot world. They are built for warmth, period. This is a big clunker of a boot that you need for those cold, high altitude climbs in Alaska, the Himalaya and some parts of South America such as Aconcagua. They are also an excellent choice for mid-winter and early spring mountaineering in the lower 48. They feature a removable liner and plastic or plastic/synthetic leather outer shell. The removable liners are key which allow you to dry them out and keep them warm in a sleeping bag at night. They are highly insulated which can keep your feet warm, but reduces their sensitivity and makes them a poor choice for more technical climbing in warmer temperatures. Some plastic boots are warmer than others and some come with built in overboots for the most extreme high altitude and cold conditions such as the 8000 meter peaks of the Himalaya. Examples would be the La Sportiva Spantik, The Lowa Civetta and the Scarpa inverno, among others. The boots above will get you by in most mountaineering situations, but if you really want the full quiver you will want that in-between workhorse boot. These boots are usually leather or synthetic leather, have some insulation for below freezing temps but they manage to keep the weight down for when the terrain gets a little technical. They do not feature a removable liner and many of them come with a built in zippered gaiter. This is boot you want for technical ice climbing in all but the coldest temps, for summer mountaineering on big mountains such as Rainier, Mont Blanc or California’s Mount Shasta. While you may ask, “why not just go with one pair of all-rounder boots?” Good question. However, when you get on technical rock in warmer temps you may find yourself struggling a bit. The same would be true on a long approach. On the other side of the spectrum, you’re asking for big trouble and perhaps a few missing toes if you try to use these boots on Denali or a 6-8 thousand meter high altitude climb. 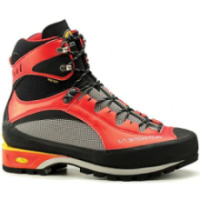 Examples of these boots are the La Sportiva Nepal EVO, The La Sportiva Batura and the Scarpa Phantom. There are other alpine climbing footwear choices such as technical rock shoes, low-top sticky rubber approach shoes and even running shoes, but these don’t really fall into the alpine climbing or mountaineering category where crampons may be required. It is not unheard of to approach a climb with mountaineering boots and then switch to your rock shoes for the technical 5th class rock climbing. It is far less common, and not usually a good idea, to approach a colder climb with lightweight footwear and then switch into a heavier boot. You are just carrying all that extra weight with the 2nd pair of footwear. An exception to that would be a long expedition with a trekking approach but usually someone, or something, else is carrying all your gear to basecamp. And finally, fit is a major concern with any footwear. Within these categories whatever fits your foot the best is the right boot for you.